I was actually doing some other post but I am not being able to complete it right now so I thought of doing a post on what I wore on my wedding day and days before that.Hope you enjoy it. FYI, I got married last year April 17th' 2009. Sorry if you are not being able to make out the design. If interested do let me know, I will post few pictures of the dress alone. This is what I wore on my engagement. You can call this a semi lehenga, with a stole. It is pista green and baby pink in color. My mother in law had sent this one for me along with few accessories like jewelry, a clutch bag in silver, a pair of stilettos from hamlyn, matching bangles and a hair clip. 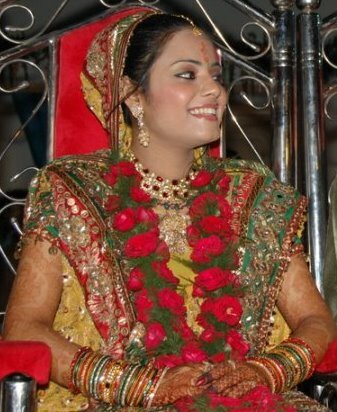 This lehenga is from PALKI, KOLKATA. The whole dress consisted of a silver, with pink and green lining, lehenga like petticoat. A pink color net semi sari with nice embroidery, a heavy green long dupatta, a silver heavy blouse and a green net stole. The whole attire was really pretty and hats off to my mil's choice. I really love this one. The above outfit is what I wore on my NEEG TILAK. This too was sent by my MIL. It consists of a green lehenga (hope you can make out a little bit of it from the right pic) and a blouse and a yellow color sari. The whole thing was really heavy but I enjoyed wearing it. It’s from Kolkata only but I don't remember the boutique's name. 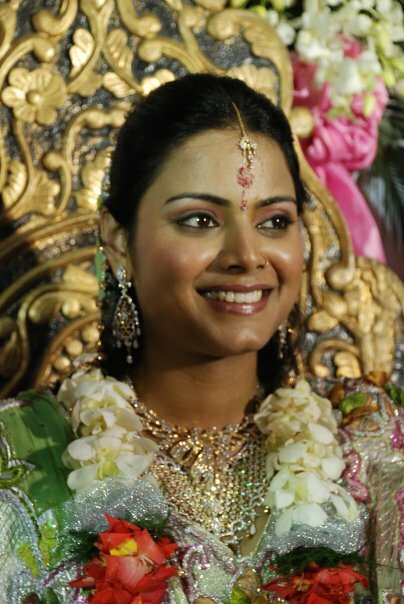 Last but not the least, the lehenga below is what I had worn on my wedding day. It was bought by me and my mother from SIA, Kolkata. 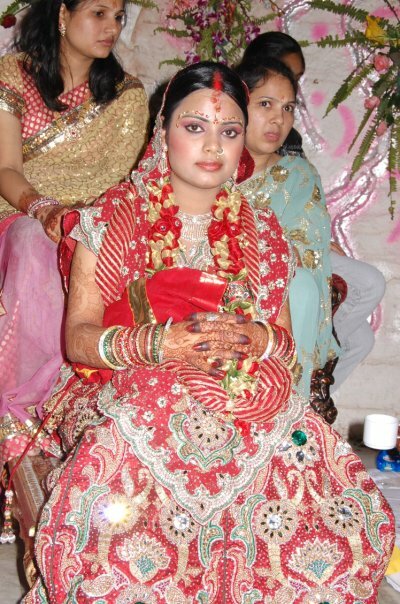 YES, I had shopped from Kolkata for my wedding. This is a proper lehenga with a blouse and chunari. The color is a red and green combination. The chunari was in net but I asked the designer to get it made in some other material. Hope you all enjoyed yourself. Labels: Bridal Wear, lehenga, marriage, OOTD, Sari, Wedding. You look gorgeous!! I love the yellow one best!! Amazing dresses and the colors are wondrous. wow! u look soooooooooooo gorgeous!especially in the second pic, and love all ur outfits! just wow! Looking gorgeous... and pretty selection of dresses. you look so pretty ...god bless you!!! wowww! you are looking soooo gorgeous...all the dresses are very pretty!